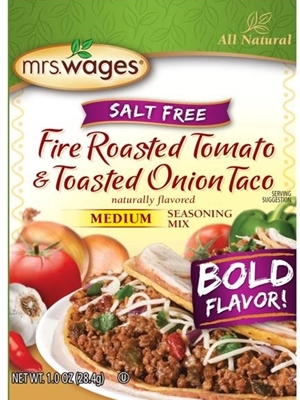 Mrs. Wages Fire Roasted Tomato & Toasted Onion Taco Seasoning Mix mix offers a bold flavor with a medium heat level and is SALT FREE! Cook meat in a medium skillet over medium-high heat for 5-7 minutes or until no longer pink; drain fat. Stir in water and seasoning mix. Bring to a boil, reduce heat and simmer 5 minutes or until most of the water has been absorbed. DEHYDRATED VEGETABLES (ONION, CHILI PEPPER, GARLIC, TOMATO, RED BELL PEPPER, GREEN BELL PEPPER, CHIPOTLE PEPPER, JALAPENO PEPPER), CORN STARCH, SPICE, SOYBEAN OIL, YEAST EXTRACT, NATURAL FLAVOR, CITRIC ACID, TAPIOCA STARCH, MALTODEXTRIN, INACTIVE YEAST, LESS THAN 2% SILICON DIOXIDE (ANTICAKING).